A very similar print medium to debossing, embossing is the subtle way of importing your logo or text onto the substrate from which your product is to be made. An embossed pattern is raised from the surface of the material. 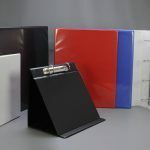 Usually embossing services are performed on leather or PU products, but embossing services are also performed on PVC’s, polypropylene and card, the latest developments also allow metal finish binders to be embossed. “Embossing” is similar to debossing, but raises the design rather than depressing it. The process involves applying pressure to the front side and back of a substrate and forcing the material down in some areas but raised from the surface in others. It is a more common form of personalisation than debossing, it is occasionally used to provide a different effect or appearance that fits a particular theme. Embossing dies are normally produced in either magnesium or brass, subject to the sight of the artwork. Dies normally take around 3-5 working days to produce from approval of our PDF proof. Blind embossing does not include the use of ink or foil to highlight the embossed area. The change in the dimensional appearance of the material is the only noticeable difference resulting from the embossing. The blind embossing process provides a clean and distinctive or subtle image on paper stock. It is best used to create a subtle impression or low level of attention to the piece, yet provide some slight form of differentiation on the finished work. Embossing is a permanent addition and lasts the lifetime of the product.